I made this for a 70 years old woman. She is well refined and loves her jewelry and flowers. I use two 10 inch round cake pans. The cake is white with a rasberry filling. It is covered with a pudding frosting. that can be used for diabetics. Jewelry is made with gum paste and mixed it with a cherry flovering. I hand crafted each piece and hand painted them with gold ediable paint. Pearls are large size sixlets. Roses are hand crafted and painted and brushed with editable gold glitter. 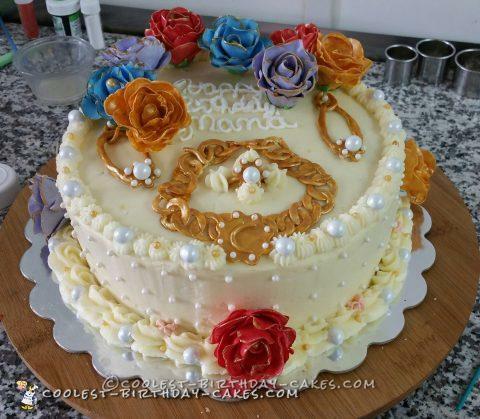 Birthday cake idea posted by Rita C.